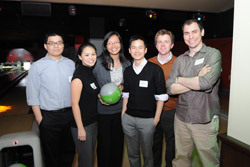 On Wednesday, November 11, 2009, the Asian American Federation hosted its first charity bowl-a-thon at Leisure Time Bowl in New York City. This special event provided a fun networking and team building opportunity for corporate affinity groups and friends. It also encouraged individuals to support a good cause this holiday season by soliciting sponsorships for and donating to the fight against poverty in our Asian communities. Participating supporters included: Goldman Sachs & Co.; AsiaNextGen; Cadwalader, Wickersham & Taft LLP; State Farm Insurance; The Grace and Mercy Foundation; and friends/colleagues of the Federation. Congratulations to team ANG who won for most funds raised and to team Cadwalader for highest average score! And State Farm’s ‘Red Dragons’ deserve an honorable mention for best team shirts! Over $4,000 was raised by donations and 100% of these proceeds will be distributed through the Asian American Community Fund to community agencies with programs and projects battling poverty issues. Thank you again to all the bowlers, their sponsors and our supporters who "spared" no expense in helping us to "strike" against poverty. * "Working but Poor: Asian American Poverty in New York City." New York: Asian American Federation, 2008.